A dental implant is a titanium post that is inserted through a minimally-invasive surgical procedure. It involves your dentist attaching the fixture to the jawbone as the two will eventually fuse into one structure to create a stable foundation. It is the latter that separates the dental implant procedure from the traditional dentures process. A prosthetic that isn’t supported by a dental implant merely rests above the gums and relies on natural suction in the mouth and dental adhesive to hold it in place. 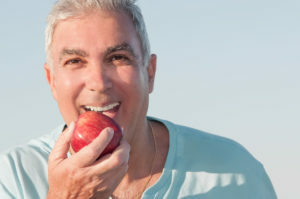 There are still other reasons patients prefer dental implants. A smile line that has missing teeth isn’t as aesthetically-pleasing as one that shows a full, healthy set of digits. Dental implants provide a way to replace either one or a full arch of teeth, which means greater confidence and more positive interactions with other people. Without a dental implant acting as an anchor, there are greater chances for restorations loosening over time. This could lead to them falling from the mouth while attempting to chew or speak. Instead of relying on a dental adhesive to hold dentures in place or clips to fasten removable bridges, the dental implant process uses a titanium abutment that attaches the restoration to the implant. This helps to create a level of stability only matched by the natural teeth roots. An acute and lingering infection can lead to severe tooth damage. If the digit is beyond repair, it may need to be extracted. After the infection is treated, the gums have healed, and the patient’s jawbone has been examined and found to be healthy enough, he or she can receive a dental implant. When there is a prolonged absence of teeth, the production of new bone cells declines, which leads to degeneration and changes in the facial structure. This can cause premature wrinkling and a more emaciated look. By providing the tension needed to trigger new bone cell growth and fortifying the jawbone, dental implants can completely change the structure and appearance of a person’s face. To learn more about the dental implant process, reach out to a dentist in Bloomfield Hills to schedule a visit. With the expert care you’ll receive, you’ll soon be able to regain the life you once knew. A graduate of the University of Michigan, Dr. David Banda has been in the dental field for three decades, yet he remains dedicated to expanding his knowledge, which is why he received advanced training from the Misch Implant Institute. Additionally, he is an affiliate of the International Congress of Oral Implantologists, the American Academy of Implant Dentistry and other organizations. Dr. Banda positively changes lives by placing dental implants at Cranbrook Dental Care. He can be reached for more information through his website. by: Dr. David Banda at November 13, 2018 .